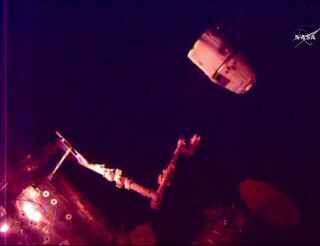 SpaceX's uncrewed Dragon spacecraft undocked from the International Space Station May 11, 2016 at 9:19 a.m. EDT (1319 GMT) after a monthlong orbital stay attached to the station. SpaceX’s robotic Dragon cargo capsule has left the International Space Station and is headed back to Earth. The uncrewed Dragon spacecraft undocked at 9:19 a.m. EDT (1319 GMT) today (May 11), ending a monthlong orbital stay attached to the space station. Dragon is scheduled to make a parachute-aided splashdown today at 2:55 p.m. EDT (1855 GMT) in the Pacific Ocean west of Baja California, where it will be retrieved via boat by SpaceX personnel. "Dragon spacecraft has served us well, and it's good to see it departing full of science, and we wish it a safe recovery back to planet Earth," British astronaut Tim Peake said from aboard the space station. Unlike the undocking, Dragon's splashdown and its recovery will not be broadcast by NASA TV, agency officials said. Dragon launched atop SpaceX's Falcon 9 rocket from Florida's Cape Canaveral Air Force Station on April 8 and reached the International Space Station (ISS) two days later. The capsule delivered nearly 7,000 lbs. (3,175 kilograms) of supplies, scientific experiments and other gear to the ISS, including an experimental inflatable habitat called the Bigelow Expandable Activity Module (BEAM). Dragon is the only robotic cargo vessel currently servicing the orbiting lab that's able to bring cargo back down to Earth. The others — Orbital ATK's Cygnus spacecraft, Russia's Progress freighter and Japan's H-II Transfer Vehicle — are designed to burn up in Earth's atmosphere, so astronauts typically simply pack them with garbage. Dragon, by contrast, is hauling about 3,700 lbs. (1,678 kg) of gear on its return trip from the ISS, including biological samples gathered during the unprecedented one-year mission of NASA's Scott Kelly and cosmonaut Mikhail Kornienko, which wrapped up in March, NASA officials said. Scientists will study the one-year mission samples to learn more about the physiological and psychological effects of long-duration spaceflight, in an effort to help pave the way for crewed missions to Mars and other distant destinations. The April 8 launch kicked off SpaceX's eighth robotic cargo mission to the space station for NASA. About 10 minutes after liftoff, the first stage of the Falcon 9 successfully landed on "Of Course I Still Love You," a robotic ship stationed in the Atlantic Ocean several hundred miles off the Florida coast. The milestone marked the first-ever landing of a rocket on a ship at sea. SpaceX repeated the achievement on May 6, during the launch of the Japanese communications satellite JCSAT-14 from Cape Canaveral. SpaceX's next Dragon cargo launch is currently scheduled for late June.